Never underestimate a snow storm. It sure isn’t summer time. I should know this by now. Twenty years at Maywood. 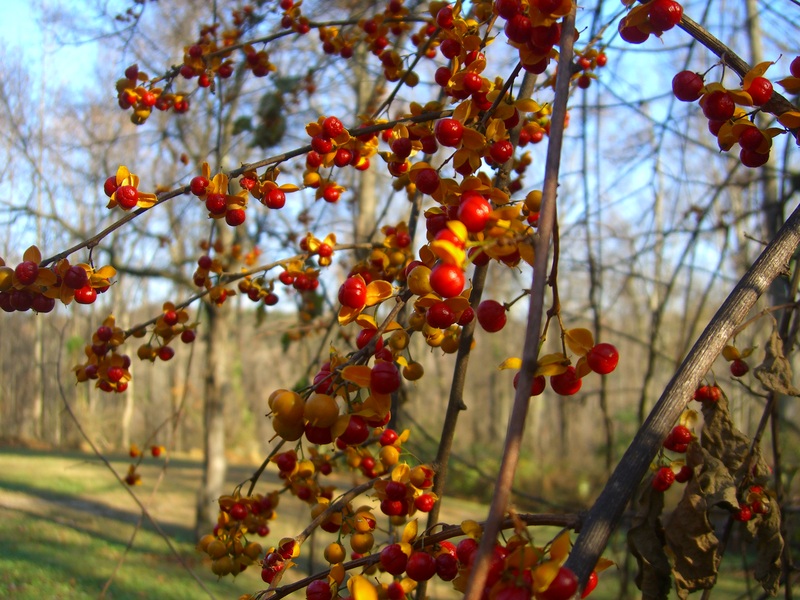 We survived the Winter of 1994 when the stream froze and the ground was white with snow and/or ice from Christmas until the first day of spring. 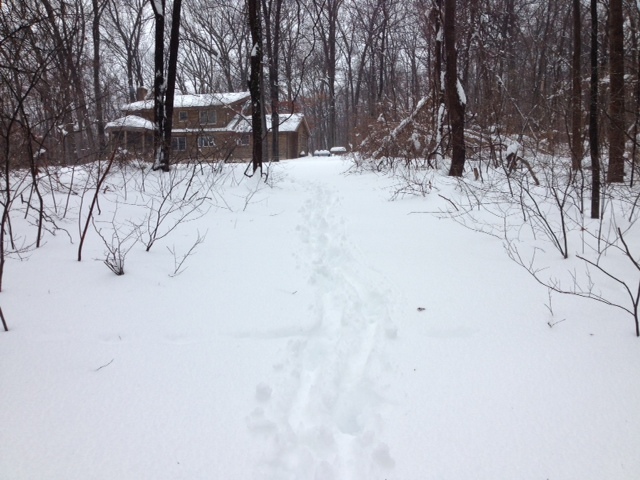 We sledded groceries down to the house…when we could get out to get groceries. We wheelbarrowed wood to the wood furnace to try to stay warm in the uninsulated Maywood House. In ’96 we made the evening news when we were the last family in Baltimore County to get plowed out. They needed front-end loaders to deal with all the snow. That was the year we drank raw milk from Vernon Foster’s cows. His grandkids didn’t want to drink it, but we were plenty glad to have it. One mile of road and we couldn’t drive it. The only way out was to drive over the corn fields where Robert Warns had plowed a path with some farm machinery. In 2010 we survived Snow-pocalyse, two back to back monster storms and a snowed in family party that I thought would never end. 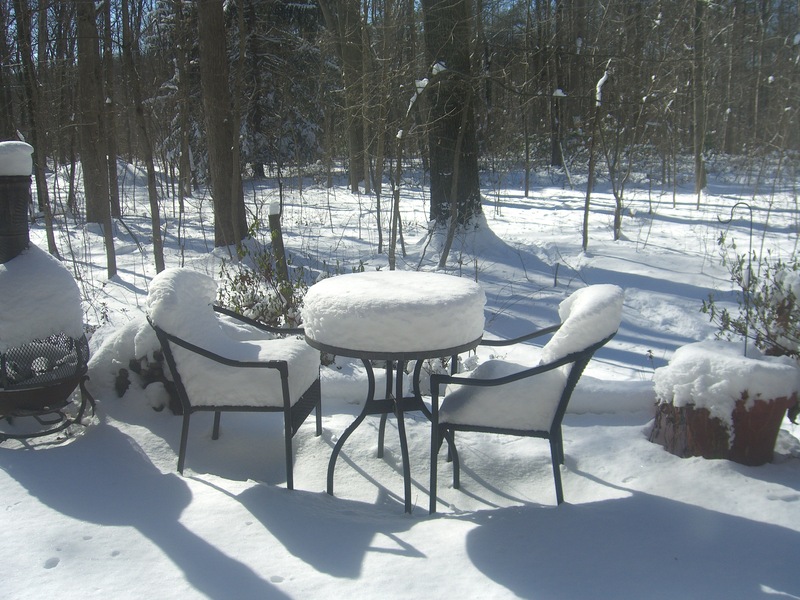 We got this much snow. YOU go out and measure it. So what’s a little prediction of 3-6 inches. That changes to 6-12 inches. Accompanied by single digit temperatures and high winds. Right? First, my in-laws lost land-line phone service. My father-in-law called on his cell phone to let me know. Our land-line is with the cable service so it didn’t affect us. Then the cable went out. No phone, no internet, no TV. No Pandora on my new wireless Bose speaker. It was looking like hubby and I would have to spend the evening in scintillating conversation. Fortunately, the smart phones still worked. I could text and post to Facebook. Cable service was restored amazingly quickly. No small feat for Comcast. Music was playing again within two hours. No sooner had I finished cleaning up the kitchen and taken a potty break, when the power went out. No lights. No water. No heat. At least the dishes were done and my bladder was empty. Pottery Barn wickless candles all over the house provided soft illumination. The flashlight app on our smartphones guided us around the house. We read by the glow of the Nook. 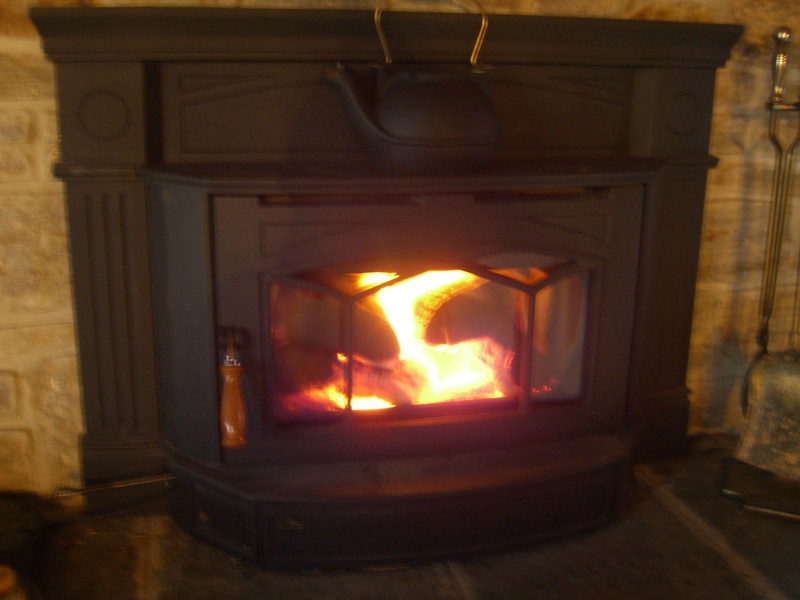 Now, we were relaxing by the wood stove without a fire because hubby said we were out of wood. With no heat (although the house was still warm), it was time to get picky about what “out of wood” meant. It did not mean “no wood.” So the few pieces down in mancave were put to use in the fireplace insert. Which, by the way, does not have a blower fan when the power is out. Radiant heat is all you get. When BGE updated the return of service from 11:15 pm to 6:45 am, it was time to call it a day. Up to bed fully clothed in fuzzy sweater, fleece pants and socks. The bed was piled high with blankets. And hubby puts off a lot of heat. I was rather comfortable. Hubby was so comfortable that he slept right through the return of power at 1:55 am, at which time the bedroom was a toasty 56 degrees. With morning we have lights, water, internet, phone, heat. There is even a fire going in the fireplace. (“Out of wood” today means that there is wood but it needs to be split.) 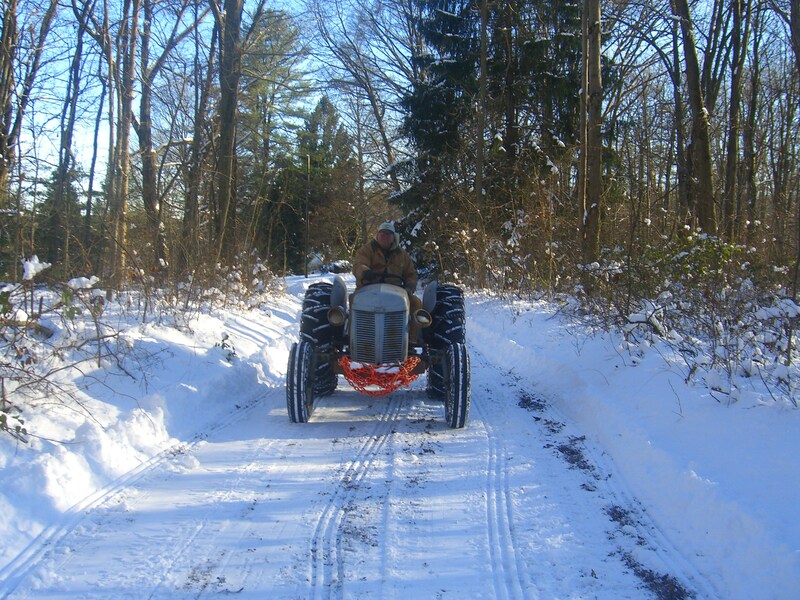 It is time for Pioneer Man to get out there on Betsy the Tractor and plow us out. Yeah, so it’s like 5 degrees out there with a wind chill. Betsy is not cooperative. She refuses to start. Oh, she was quite willing to start two nights ago when it was 40 degrees out. But now her hydraulic fluid is like sludge. I don’t blame her, really. I feel that way too on cold mornings. Don’t you just hate it when your hydraulic fluid feels like sludge? But how will we get out? This snow is not going to be melting anytime soon. Pioneer Man calls our neighbor who also has a vintage tractor like Betsy. Neighbor and family are sick with the flu. They hired someone to plow them out. “How much?” asks Pioneer Man. “Don’t know. He’s going to bill me,” replies flu-stricken neighbor. Whoa. He’s really going to feel ill when that bill comes. We ponder ways to warm up Betsy. There is a torpedo-like heater in the Room of Outer Darkness. (“Which room of outer darkness?”the daughters may ask. We have so many. The Room of Outer Darkness is the room off the shop underneath the side porch. It would make an excellent wine cellar for someone organized and with an ability to not drink every bottle as soon as it enters the house.) Anyway, this torpedo heater is like the ones you see on the sidelines of football games to warm up the players. It was left here by a contractor once upon a time. It runs on kerosene. We don’t have any kerosene. We have wine and whiskey, though. I stocked up on important things before the storm. In the bee’s midwinter not so long ago. Ok, so I changed a couple of words. 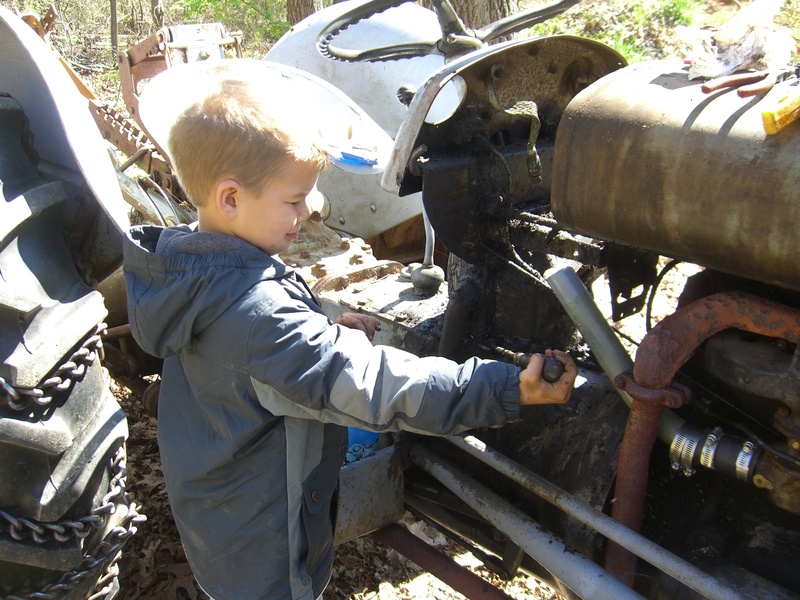 After a morning fussing with the tractor, he identified the problem as the ignition switch. But he got the job done! Winter has hit hard with the New Year. Six inches of fresh snow blanket Maywood. My car remains halfway down the driveway where I abandoned it last night for fear of sliding right into the house. (I had already inched my way down the Wicked Curve on Miller Lane as another car tried to make its way up the Wicked Curve, neither of us able to back up.) As I click at the keyboard this morning in blinding snowlight, Maywood Man is outside trying to get the tractor to start so that he can begin plowing. It is 11 degrees with 25 mph winds. The snow dazzles under cloudless blue skies. Gusts of wind blow through snow-laden branches and send the powdery flakes whirling like smoke. It is stunningly beautiful from my indoor perspective near a cozy wood stove. Homemade butternut squash awaits my frozen plowman when he comes in from clearing the road. 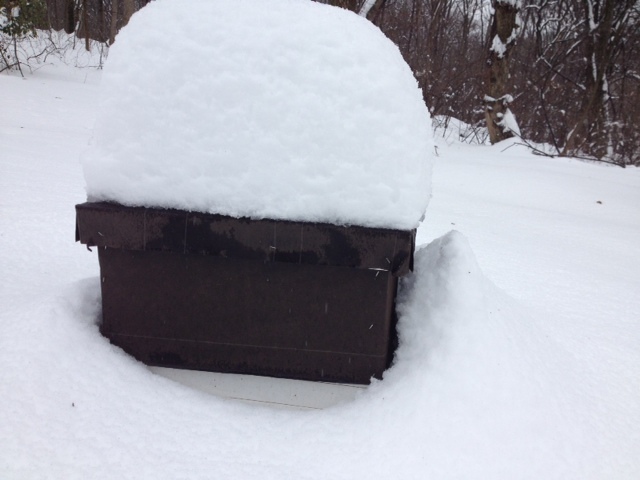 Judging from the dip in the snow on top, the hive is warm enough to melt it. Icicles are on the outside of the hive. I’m guessing the perspective inside the bee hives is less spectacular. It is the bleak midwinter for them. 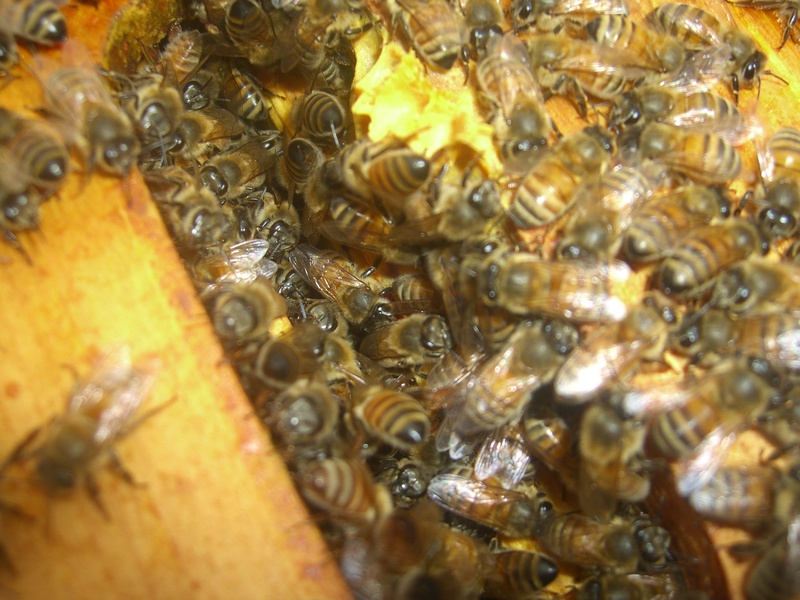 Too cold to leave the hive, they huddle in a ball to maintain the hive temperature. They eat the honey they stored last summer. 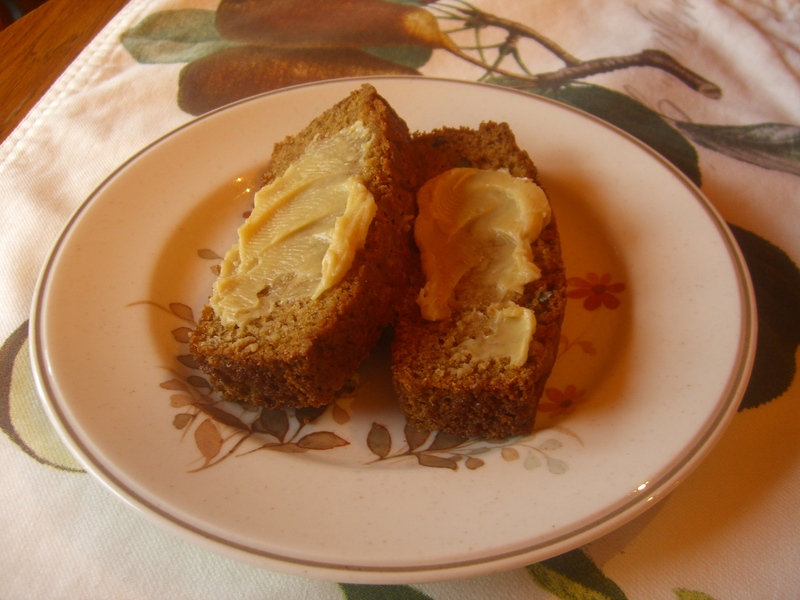 They also have grease patties that Mr. Beekeeper/Plowman made for them, a combination of sugar and Crisco. 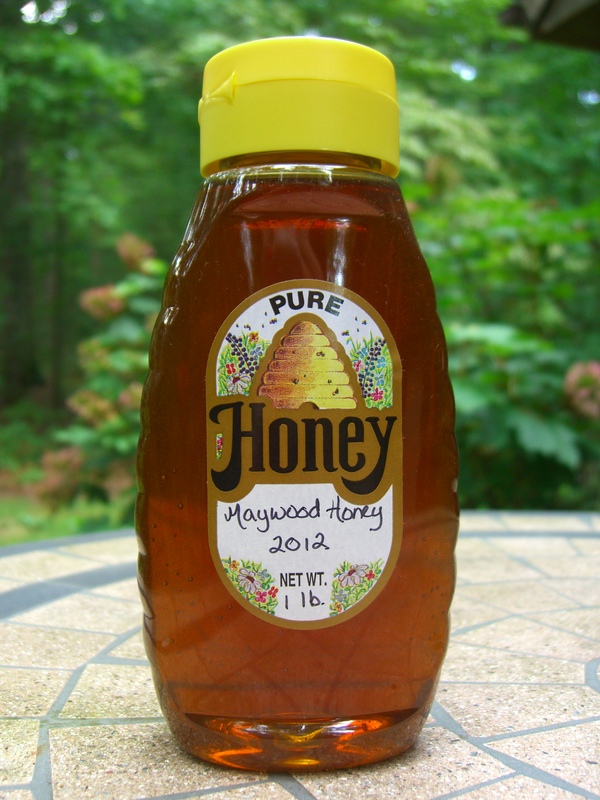 If they have sufficient numbers, they can keep the hive warm enough to move around to the honey. 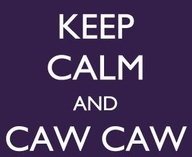 If not, they eat what is nearby and hopefully don’t starve before the weather warms up. At Winter Solstice, bees were busy, but still had plenty of grease patties. Two weeks ago, on a balmy almost 70 degree day, we took a peek in the hives to assess their strength and to offer more grease patties. The hives were all active with plenty of bees coming and going. 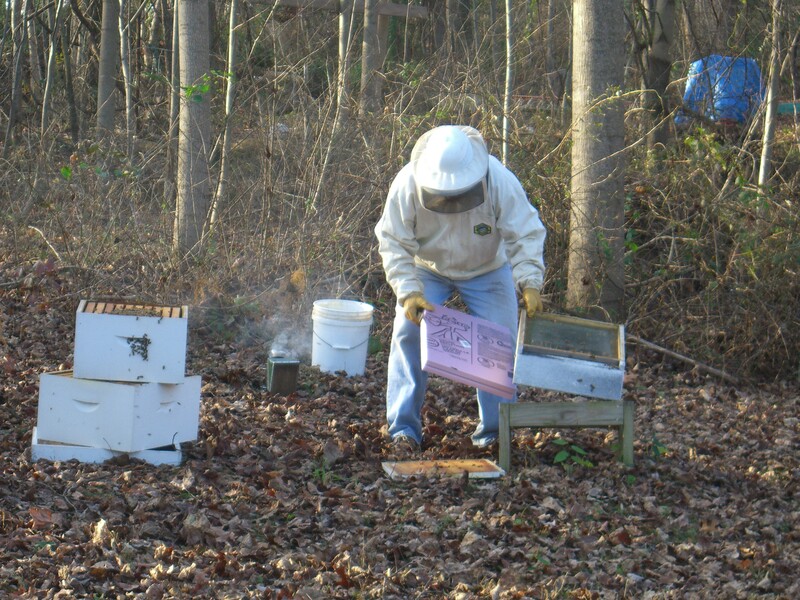 Although the bees have no plants to pollinate in winter, they use the warm winter days for cleansing flights. Yes, the ladies must keep the hive clean! Some bees were nibbling at the grease patties, but they had still had plenty from the last gift– good sign, I think, that they had plenty else to eat. 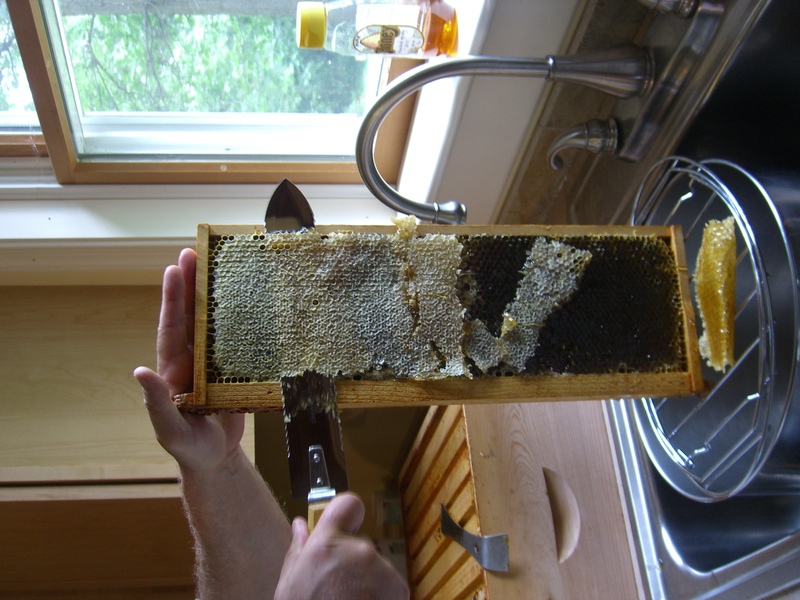 A week later, Mr. Beekeeper took another quick peek. Hive B was low in numbers. So now he has reason to worry. Should he have removed the grease patties and replaced them with easier to digest fondant? 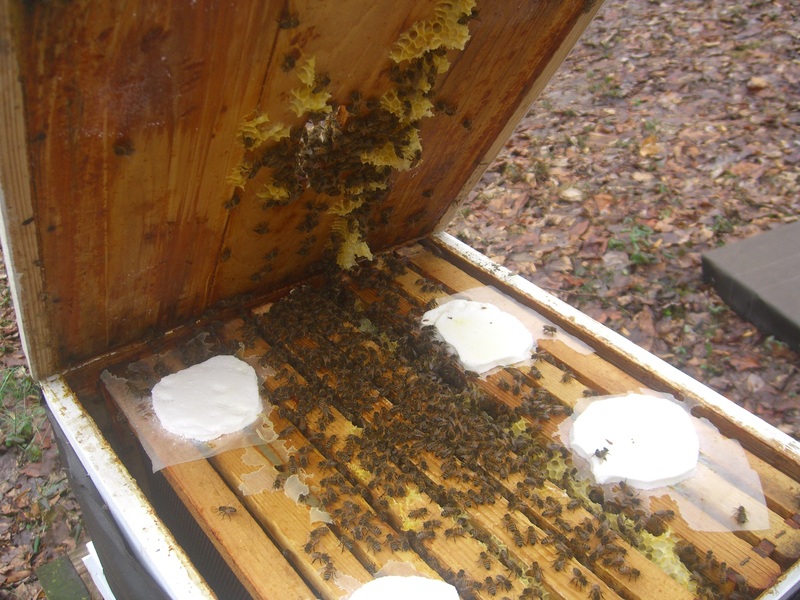 Is there enough air circulation to keep moisture from building up and freezing into tiny stalactites in the hives? Should he sweep the snow from around the hives? Or leave it to act as a blanket? If he could put tiny little blankets on each of his bees, I think he would do it. 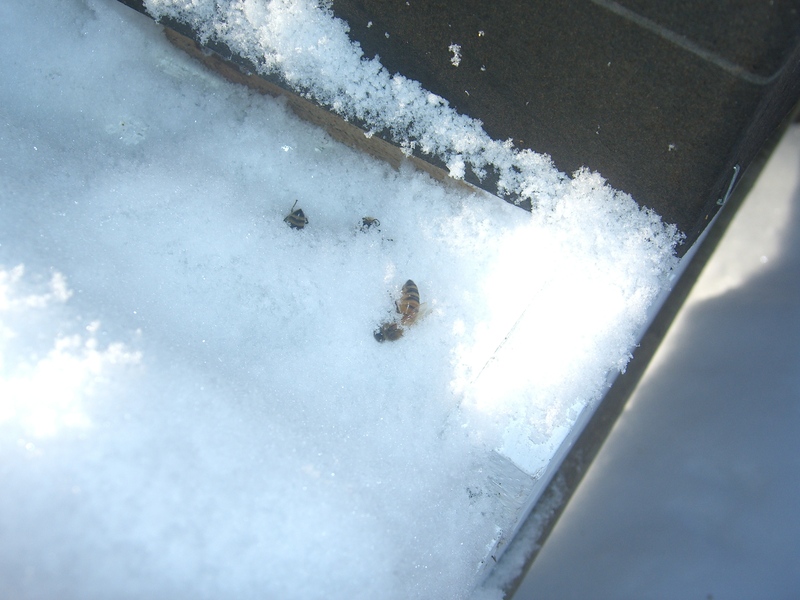 A couple of dead bees at the entrance to Hive C.
Last winter we lost all four hives before Christmas. It hadn’t even gotten really cold yet, but their numbers were too low to keep themselves warm. 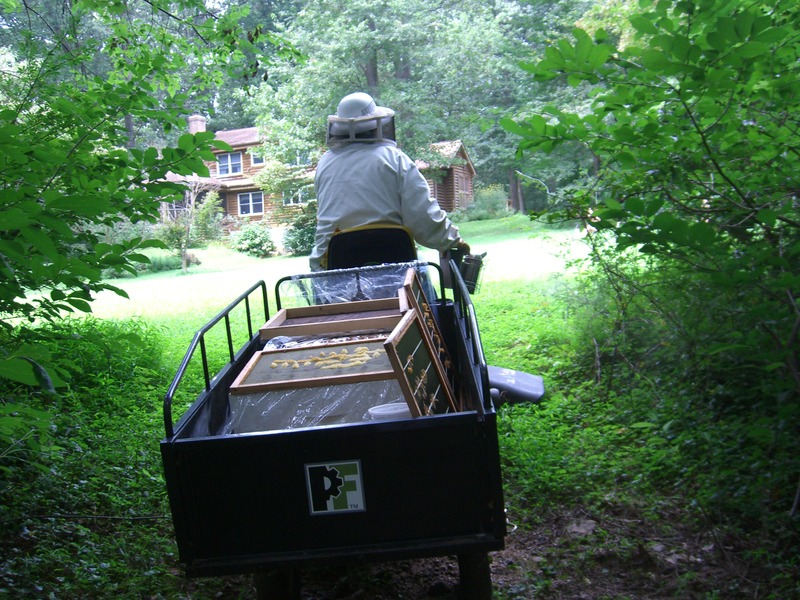 This year, the hives are wrapped for solar heat in tar paper and they have plenty to eat. They just need to stay warm. Weather like today’s does not make it easy. 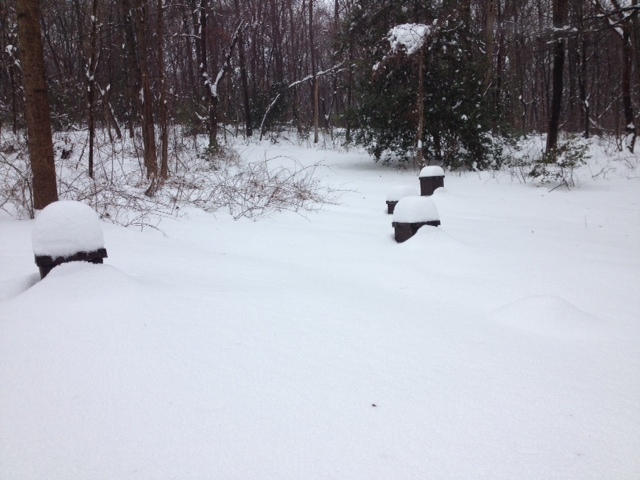 As my son-in-law commented, we went to bed in Maryland but woke up in Siberia. Ah, but that’s the thing about Maryland. The weather is always changing. If the bees can get through this week’s projected snow, rain, ice, and minus two degrees, by next Friday it is supposed to reach 40. Hang in there, little bees! We’ve passed the Winter Solstice. The days are getting longer. Q: What does one do the Sunday between football play-offs and the Super Bowl? A: The things that didn’t get done while lolling on the sofa quaffing beers every Sunday since August. One could watch TV–there’s a Barry Manilow themed ice-skating show on. That’ll get a man outside doing manly things quicker than you can say, well, Barry Manilow. It’s bad enough getting sucked into Downton Abbey, but ice-skating? One has to draw the line somewhere. 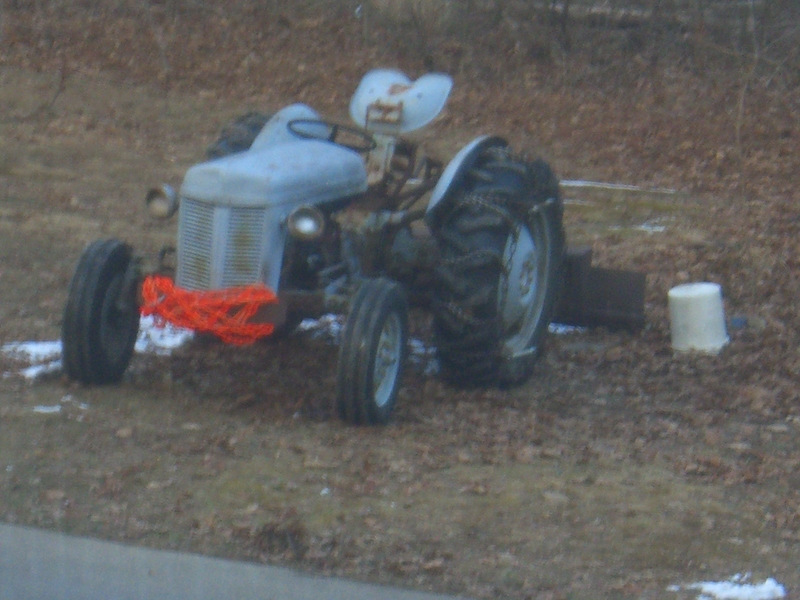 And this is why Maywood Man is outside with his vintage Maywood equipment doing Maywood tasks. Best alternate source of heat is the woodstove. It’s good timing for a by-week from football. 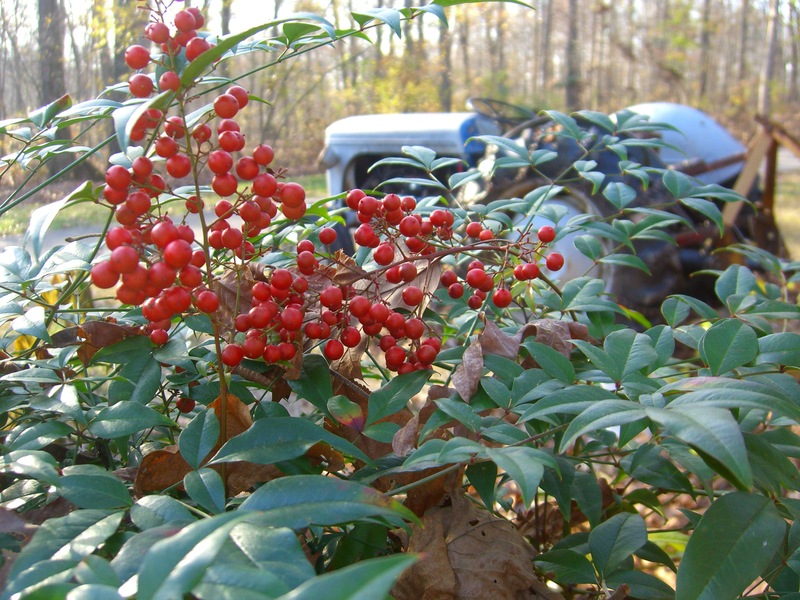 Last week, just as the arctic chill sent Maryland temperatures into the teens, the furnace conked out. The new furnace is being installed tomorrow, as the temperatures begin to climb this week toward the 50’s. It hasn’t been too painful, though. Like NASA, we have engineered redundancy around here. We have two furnaces. Bedroom doors stayed open while the downstairs furnace worked to heat the whole house. The wood stove supplemented the downstairs furnace. 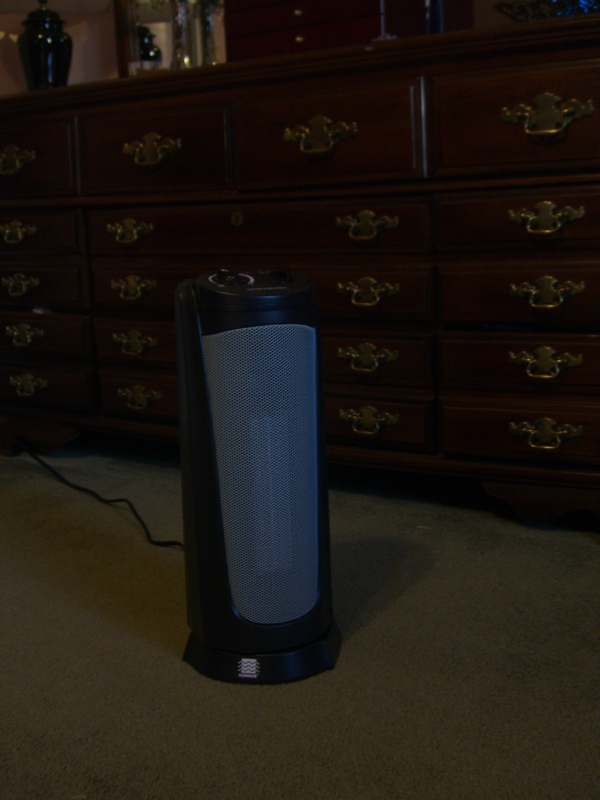 At night, we shut bedroom doors and kept quite comfortably warm with space heaters. Murphy’s Law #658–If you buy an extra heater for the classroom so that your assistant principal doesn’t have to give up hers, your classroom will be too hot to need a heater. But we are now out of firewood. Well, not out of wood. We’re just out of pre-cut pieces ready to toss in the wood-stove. This afternoon, I type to the soothing buzz of the chain-saw in the “lumber yard.” Tonight, I look forward to watching Downton Abbey in real time by a roaring fire. Maywood Man will probably fall asleep from this afternoon’s exertions. Maybe–just to get a rise out of him– I’ll jump up periodically and scream, “Come on, Flacco!” like our toddler grandson John. It’s a fuzzy picture because I took it through a screen. You think I’m going out in the cold to take a picture of a tractor? 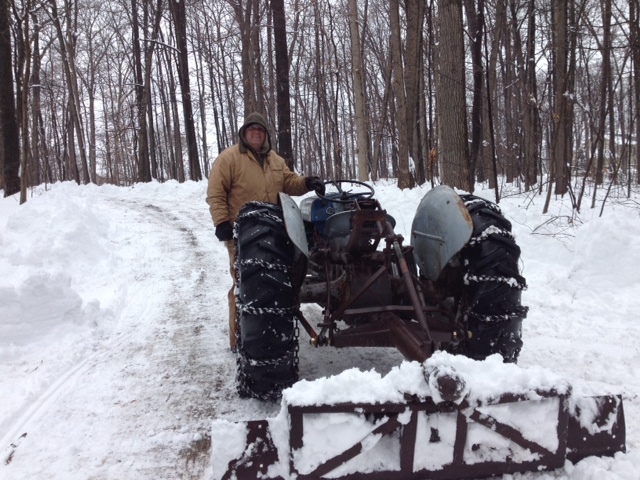 Big John would have cut firewood yesterday, but he was wrapped up with tractor repairs. Well, of course. Or as the French say, Mais oui. Murphy’s Law #342: The furnace will conk out when the temperature nose dives into the teens. 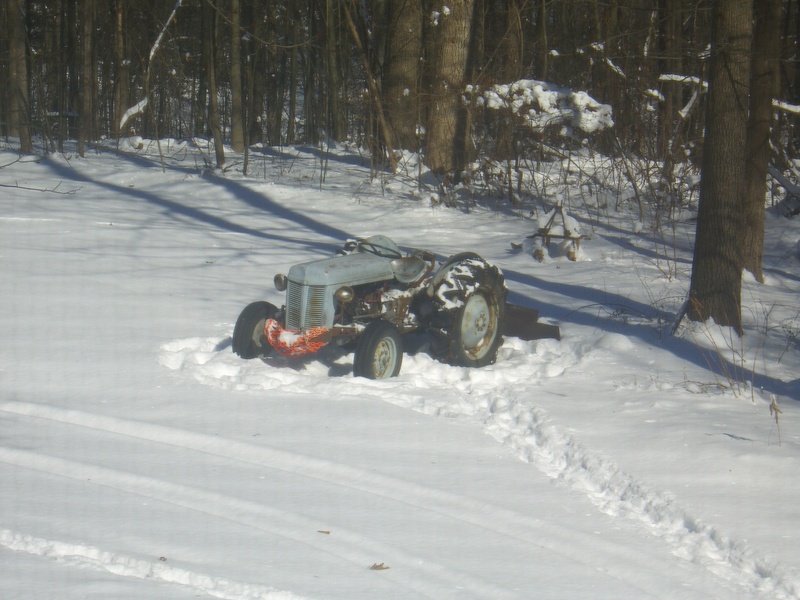 Murphy’s Law #572: The tractor will break down if it snows. Not a lot. I got a two-hour school delay for snow on Thursday. Friday I got a two-hour early dismissal. Mere dustings…just enough to cause massive traffic delays around the Baltimore-D.C area. Just enough to tell the tractor to break down. 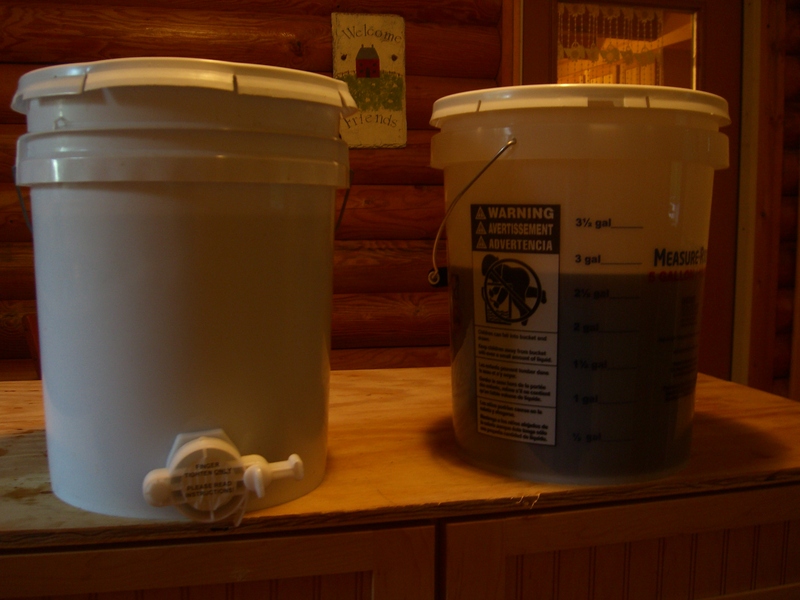 Murphy’s Law # 691: If you think you have enough hydraulic fluid at home, you will discover that you do not. Today, before bonding with his chain saw, Maywood Man took a ride to Shewsbury for hydraulic fluid. The tractor is now ready to go. Tomorrow the furnace will be purring and the firewood will be stacked high on the porch. 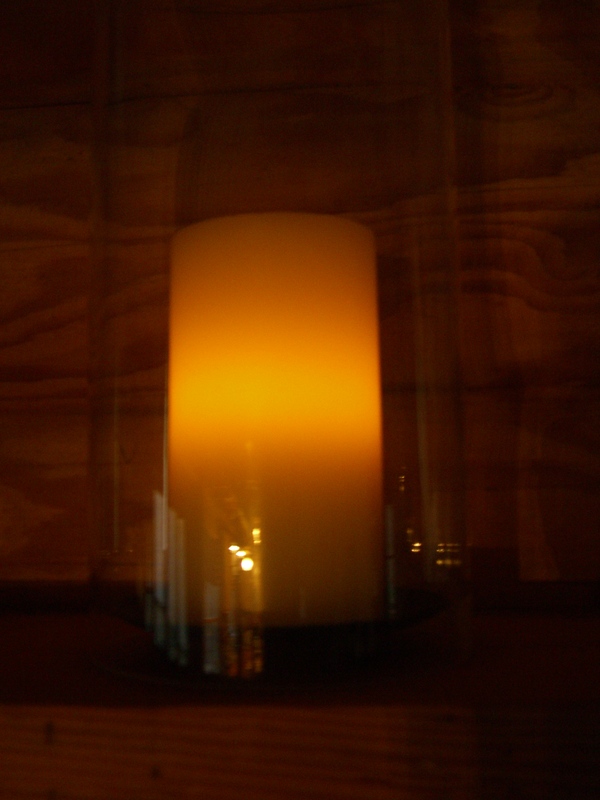 Pottery Barn wickless candles–great for ambience but useless as a heat source. Dare I predict balmy weather in Baltimore for the Super Bowl? I’m not going to get cocky. A quick check at weather tells me that the furnace could be delayed by ice tomorrow. Murphy’s Law #343: Ice storms will hit the day you schedule a furnace installation. Now I have a real dilemma. Do I wish for a day off school due to weather? Or do I wish for clear weather and a furnace? 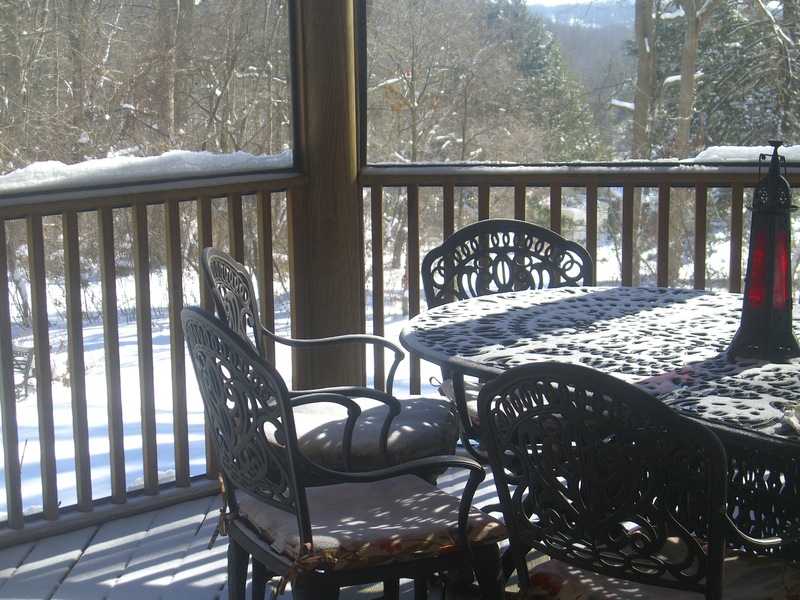 What I wish for is to watch the Raven’s win the Super Bowl in a nice warm house. And Murphy is not invited. 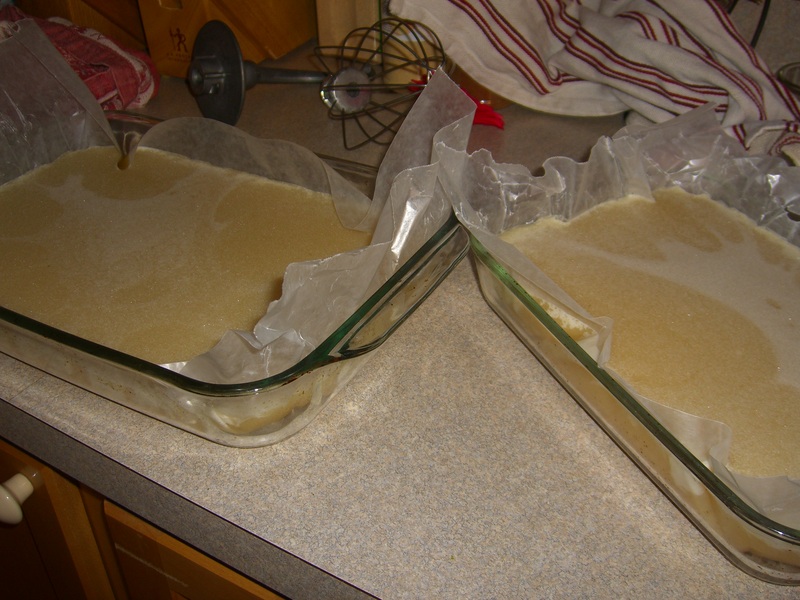 A twenty-five pound bag of sugar is empty in the kitchen. Dinner was delayed because the stock pot of bubbling sugar water was taking up most of the stove space. All of my pyrex casseroles are filled with sweets that we won’t be eating. 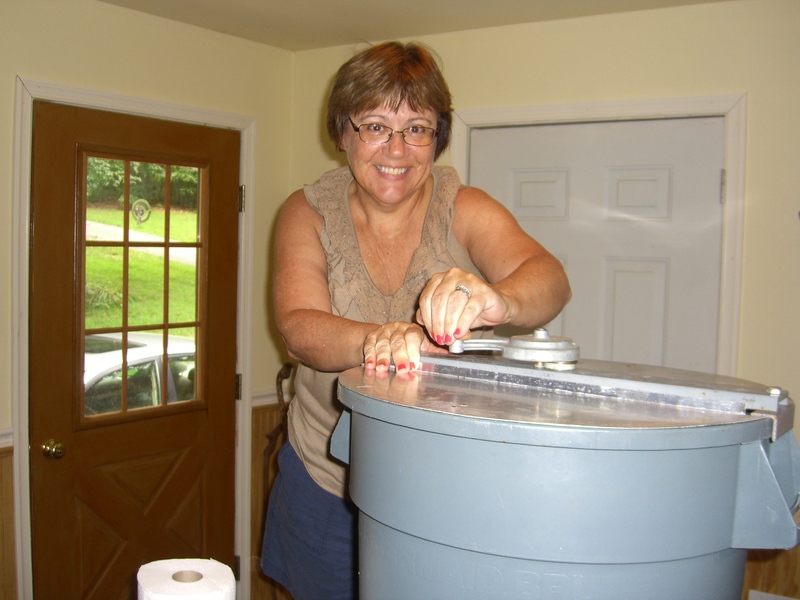 A five gallon bucket and a paint stirrer are coated with sugar syrup. And there are splatters of syrup everywhere–on the counters, on the (freshly mopped) floor, on the floor mats, even on my bee hat. All the evidence points to John. He’s been making fondant for the bees. 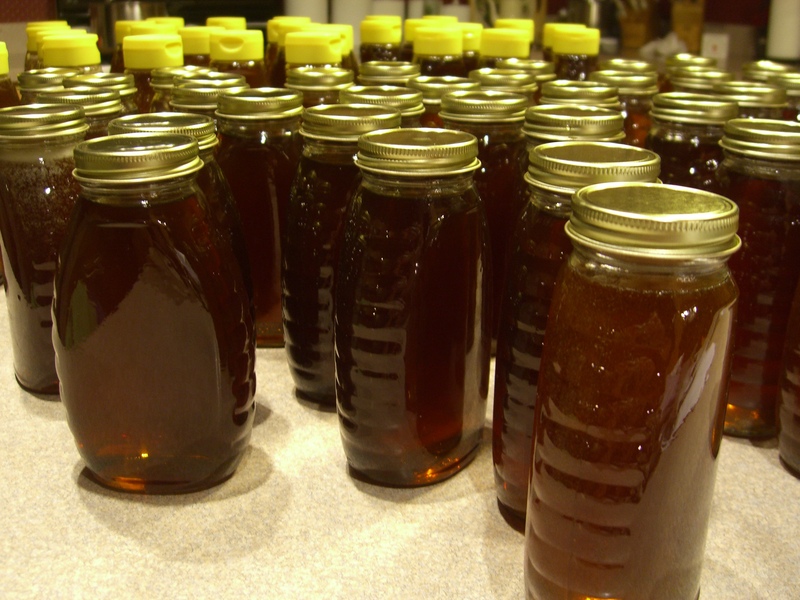 We did nothing to prepare the bees for a hurricane. And nothing happened to them. That’s partly because they are on a sheltered hillside and mainly because the storm pounded north of us. 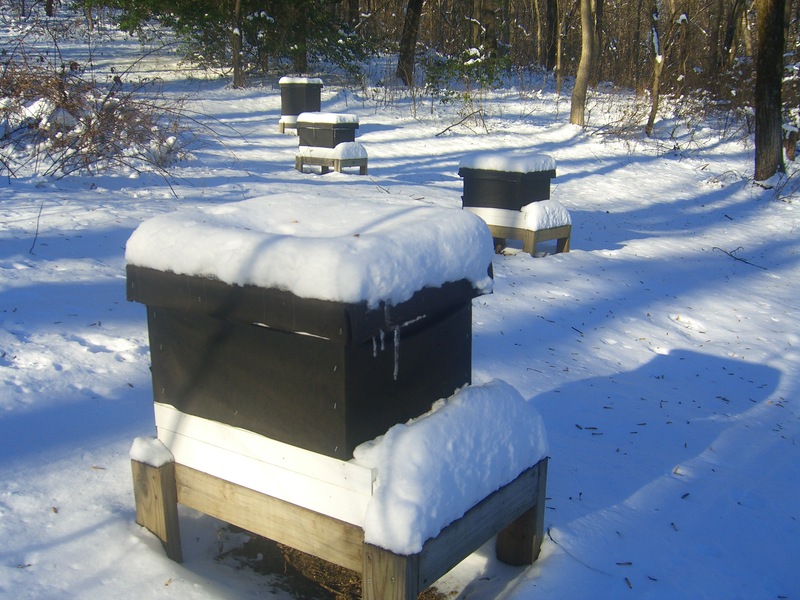 Winter, however, has often hit the bees hard, so it is important to tuck them in for the season. 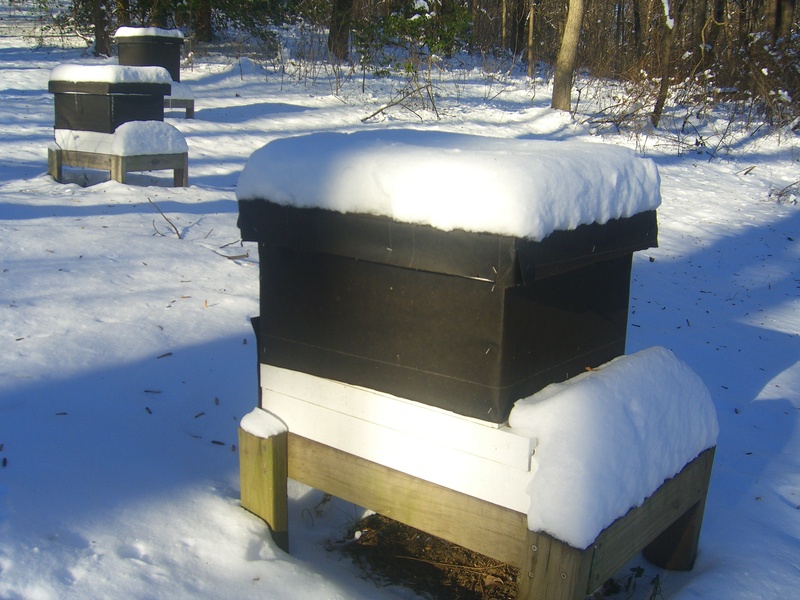 Today’s goal was to winterize the bees with insulation and to stock the hive with a store of fondant to eat throughout the barren winter months. Only half the task got done. 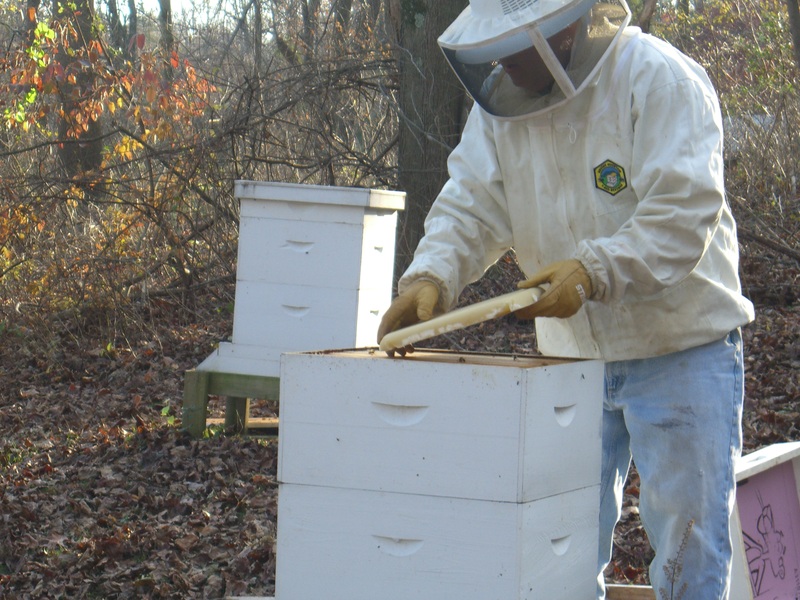 Ironically, this November day was so warm that the bees were too active for John to wrap the hives. 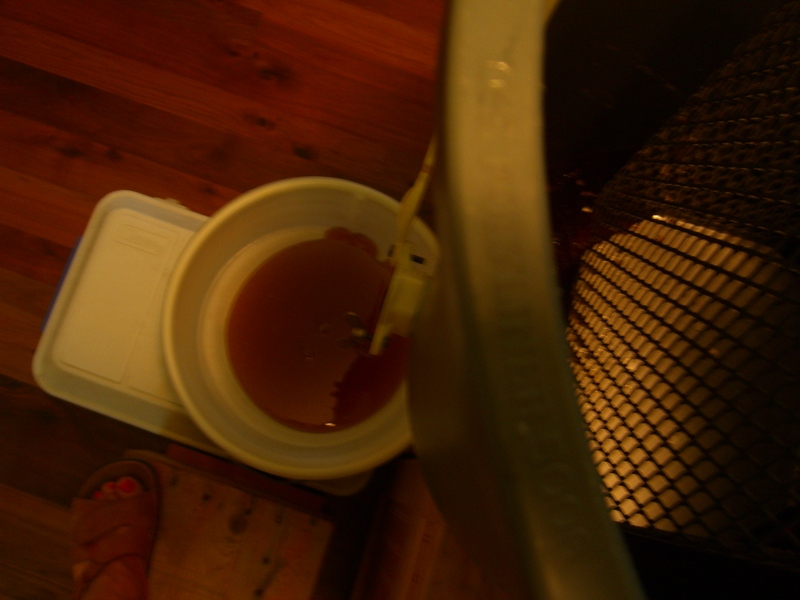 At least the floor and ceiling of the hives got winterized and the fondant placed in the feeder box. 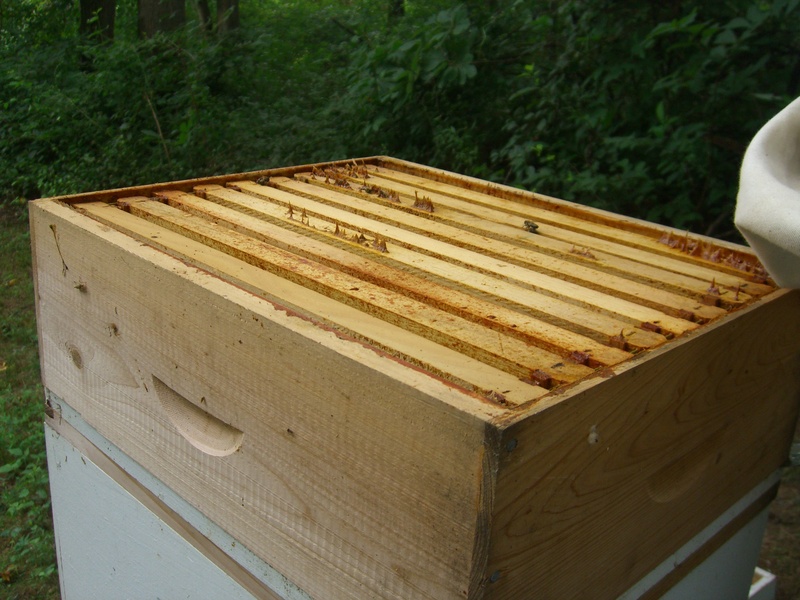 A piece of insulation board is fitted to the bottom hive box. This will help protect the bees from cold air coming in underneath the hive. 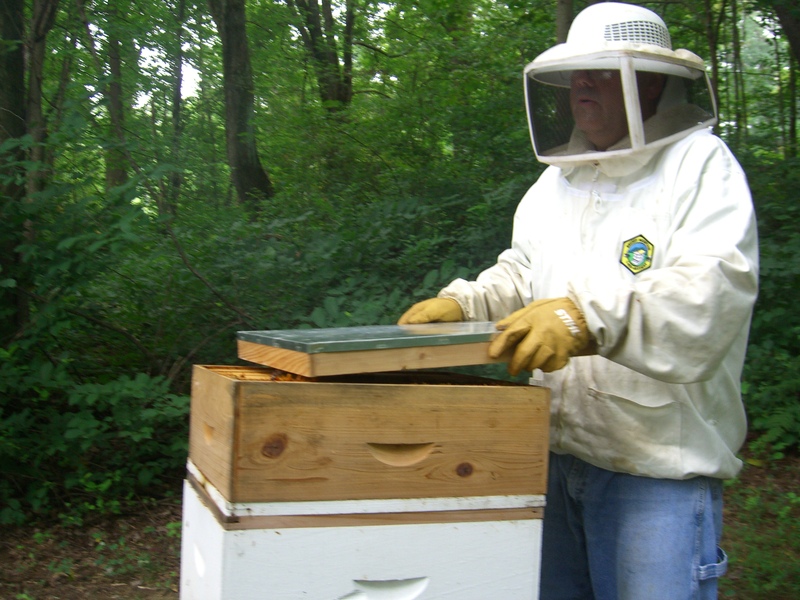 On top of the hive, John puts a feeder box. 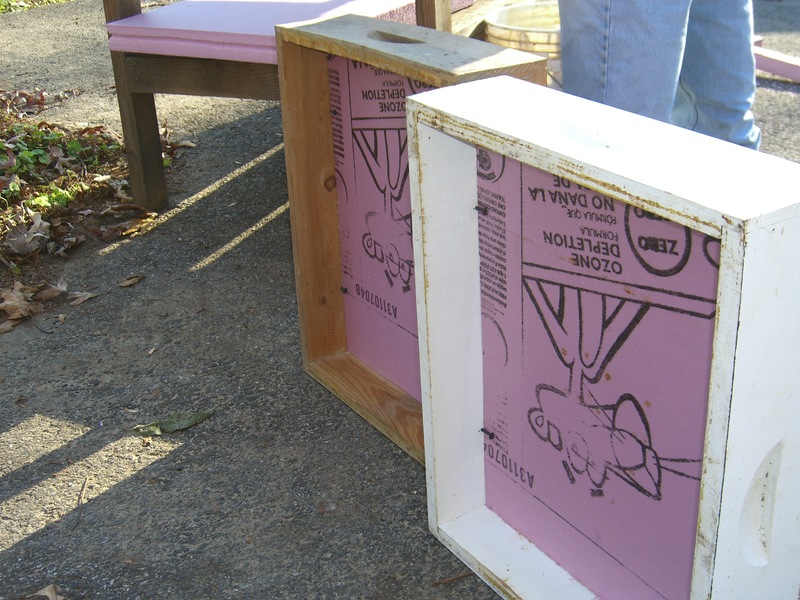 It usually has a tray for sugar water, but for winter John removes the tray and fits the box with a piece of insulation. This will protect the top of the hive from cold air. John places a big piece of fondant on top of the honey frames. The insulated lid sits on top of it. 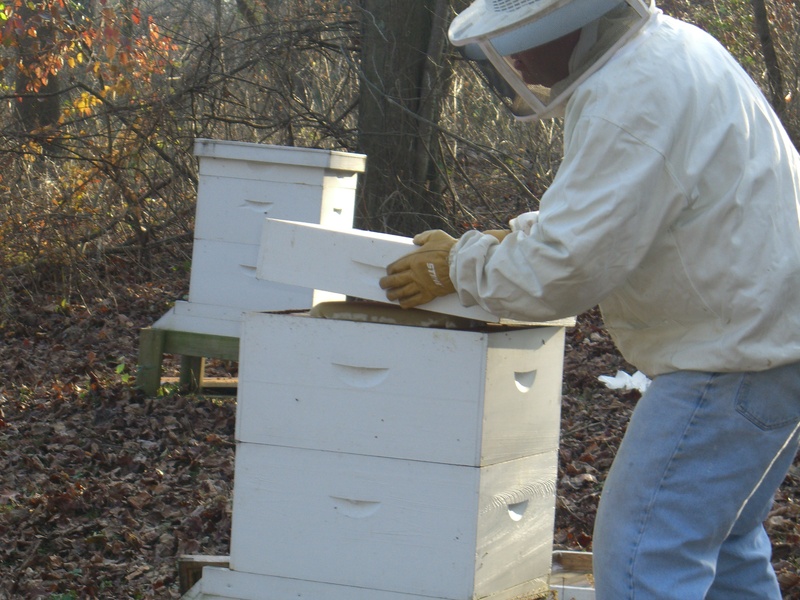 Later, when it’s colder and the bees are staying inside, John will insulate the outside of the hive too. 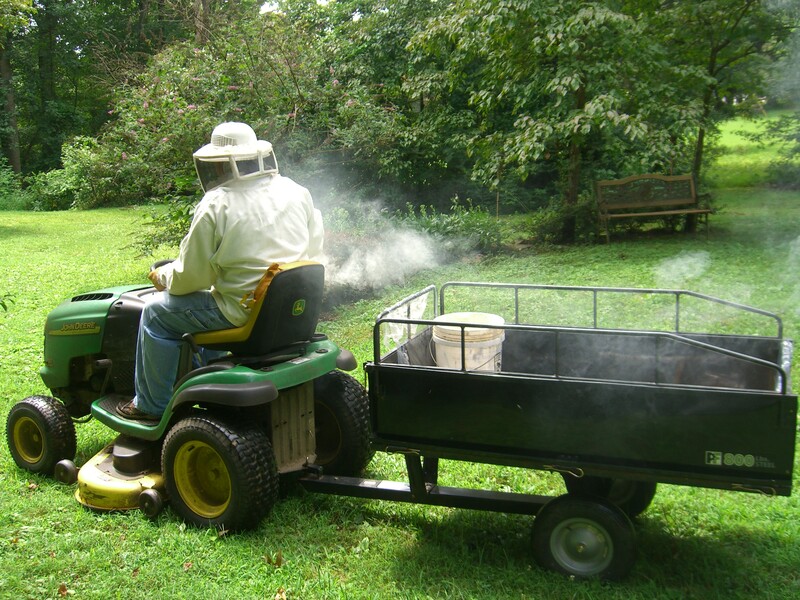 Alas, insulating the bees is akin to having the tractor in working order—it’s one of Murphy’s Laws that if we are prepared for winter, we won’t get one. The tractor is running great at the moment. Last week I got my first dose of winter on a day trip to New York City. I can wait for snow. 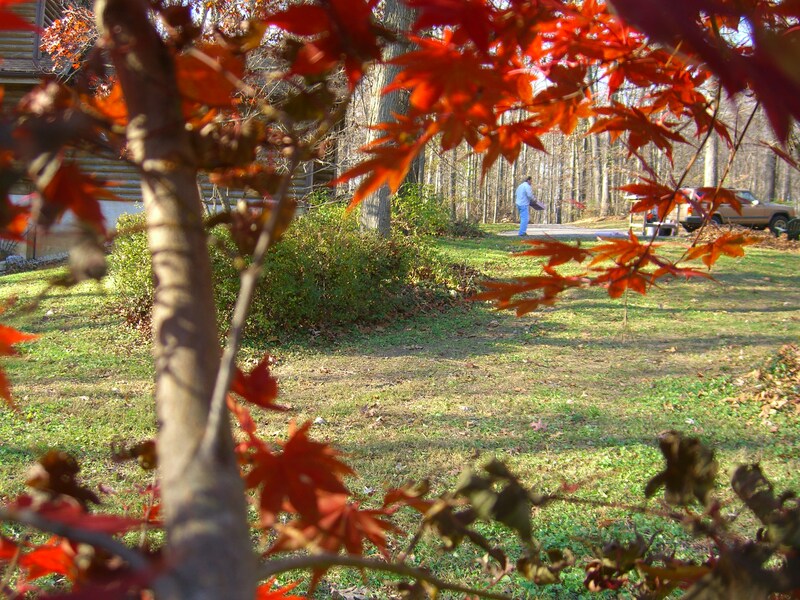 For now, there’s plenty of autumn left to enjoy. Apparently the bees think so, too. 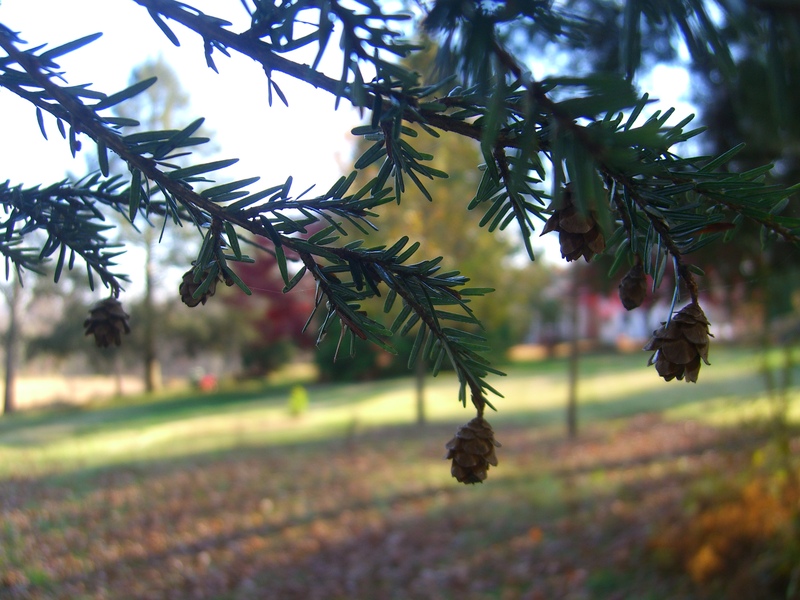 In another month, I’ll be decorating with evergreens. It was too quiet Friday morning, so I looked outside and saw the little guy working on the tractor with PopPop. From the upstairs window it was just the cutest thing. Then I went outside to inspect closer. Oh my. Grandson was busy at work scraping gunk off the tractor engine. This is a 1952 tractor and I know for a fact that no one has cleaned any gunk off that tractor since we moved up here in 1993, and who knows when before that. But PopPop had the six-year-old happily at work. The smile on kiddo’s face attested to “happy;” the automotive grease smeared all over his face, winter coat, and jeans attested to work. And then there were his hands. We have countless pairs of disposable gloves around the house, but why would you give a boy gloves to wear to scrape twenty years of engine gunk off a tractor? Hmmm???? The kid had man hands. No, I’m not referring to the Seinfeld episode. I’m referring to the man-sized grime on those little mitts. He looked like a regular mechanic, and he was proud of it, too. Well, before Mr. Junior Mechanic entered the house he needed a lesson on how to use the de-greaser. 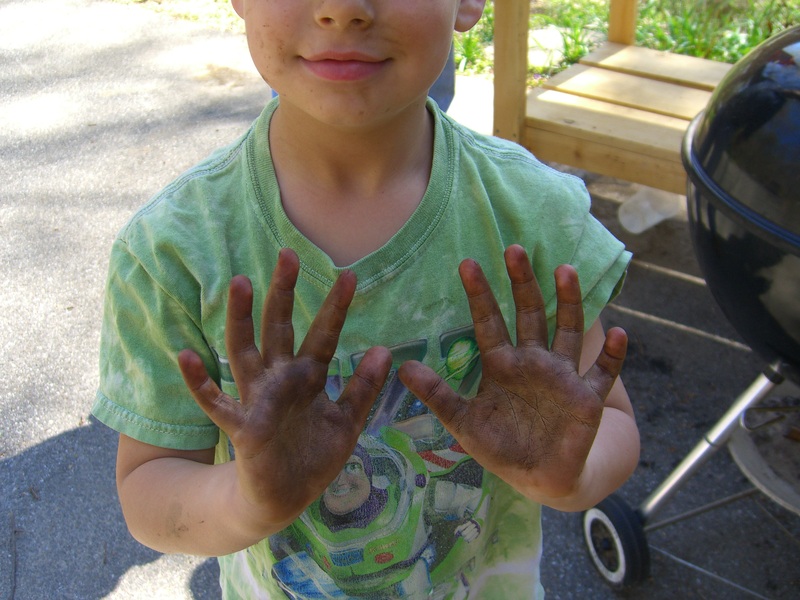 It’s pretty cool for a kid to have hands are sooooo dirty that he has to use a pre-wash on them. He dutifully used the de-greaser (twice, at my insistence) and rubbed the grimy glop off his hands with paper towels. Then we went upstairs to the bathroom, with me opening all doors and turning all knobs. Gobs and blobs of soap followed, with a soak in the sink and a nail brush loaded with more soap. Grimy clothes were removed and deposited by the washer to await PopPop’s grimy additions later. Cleaner than tractor grease, but dirt + water + boy still = needs a bath. Earlier in the week, grandson helped PopPop with sawyering. That was a cleaner project–even with the tumbles into the dirt. 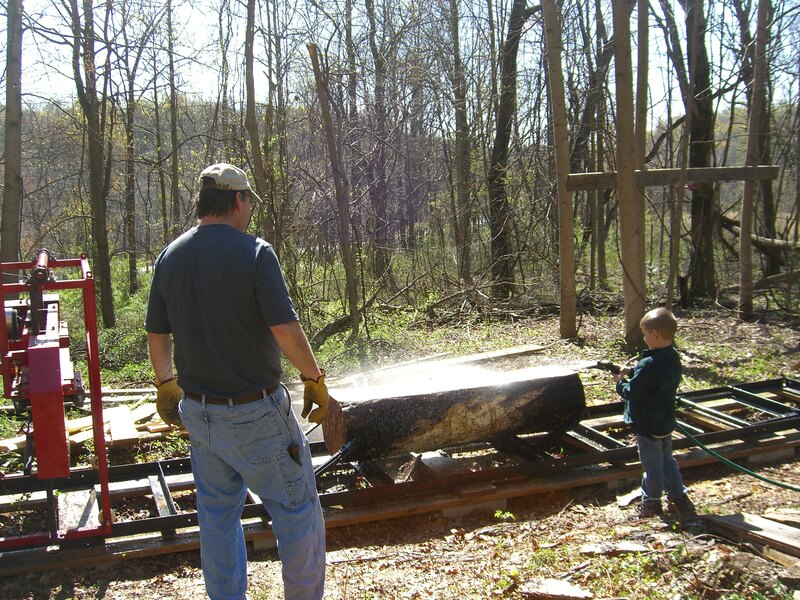 His job was to hose off the logs and then each board as it was sawn. When not busy with the hose, he climbed all over any logs or branches he could find. He made an impromptu see-saw from a few pieces of wood. Later, he practiced his balancing by walking across logs. I pondered briefly whether he might break his arm or something if he fell, but I still managed to get distracted by PopPop cutting down a tree just as the little guy fell from his balancing post. He points to his chest. A quick examination reveals a three-inch scratch. We go inside to clean it and apply a band-aid the size of Montana. I warn him that a band-aid that size will freak out his mother. And sure enough it does, because he knows just how to present it. He pulls up his shirt to reveal the band-aid the size of Montana. I’m upstairs but can hear her maternal wail. The kid is totally messing with her. There is nothing wrong with him. He is 100% boy. And he knows his mom is 100% girl. He has already figured out how to work that. And after a day of hosing logs and falling over trees, he doesn’t understand why he might need to change and wash up before heading off to a birthday party. Ah…little man. And learning from the master of dirt himself–PopPop.